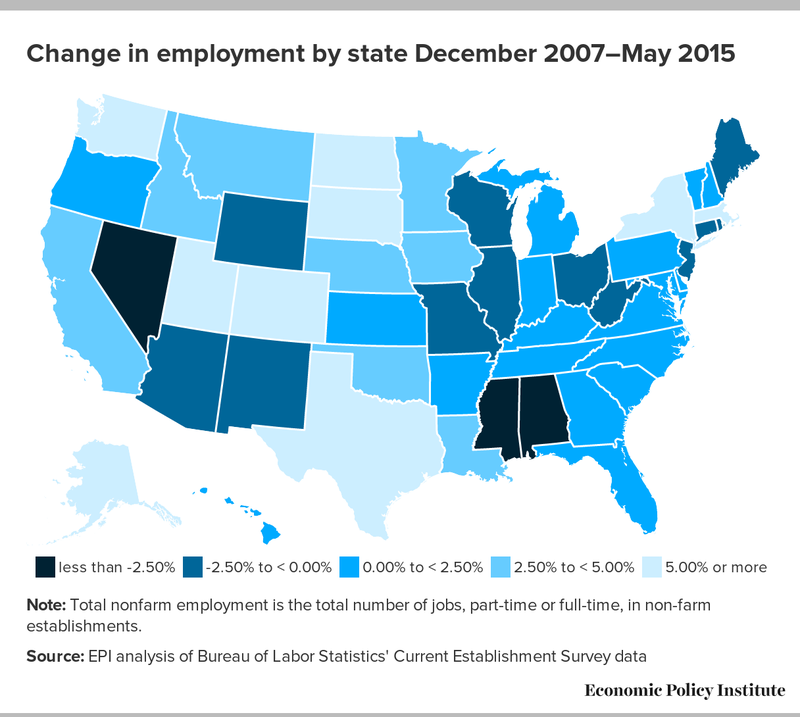 The Bureau of Labor Statistics’ May State Employment and Unemployment report showed most states continued on the generally positive—albeit somewhat unremarkable—track they’ve been on for the past year. Since May of 2014, all but one state (West Virginia) have added jobs, and unemployment has fallen in all but five states: Louisiana, North Dakota, South Carolina, South Dakota, and West Virginia. The only slight dark spot in recent trends is that, as with last month’s report, it appears the well of jobs from the oil and gas boom seems to be drying up. In states where growth from the boom has been explosive (North Dakota, Oklahoma), this slowdown still leaves them well ahead of the pack. From February 2015 to May 2015, 38 states and the District of Columbia added jobs. Nevada (+1.3 percent), Rhode Island (+1.3 percent), and Maine (+1.0 percent) had the largest percentage gains. All three of these states showed some acceleration in job growth in recent months, although none of the three has yet to recover all the jobs they lost in the Recession. From February to May, 11 states lost jobs, with the biggest percentage losses occurring in North Dakota (-1.8 percent), Wyoming (-1.3 percent), and Oklahoma (-0.6 percent). For the country as a whole, employment grew by 0.4 percent over the same period. Unemployment fell in 25 states from February to May, with Washington (-0.9 ppt), Tennessee (-0.8 ppt), and Indiana (-0.8 ppt) experiencing the largest reductions. Washington state and the broader Pacific Region have had impressive labor market improvements over the past year, as Pacific states have increased employment and reduced unemployment faster than any other region of the country. 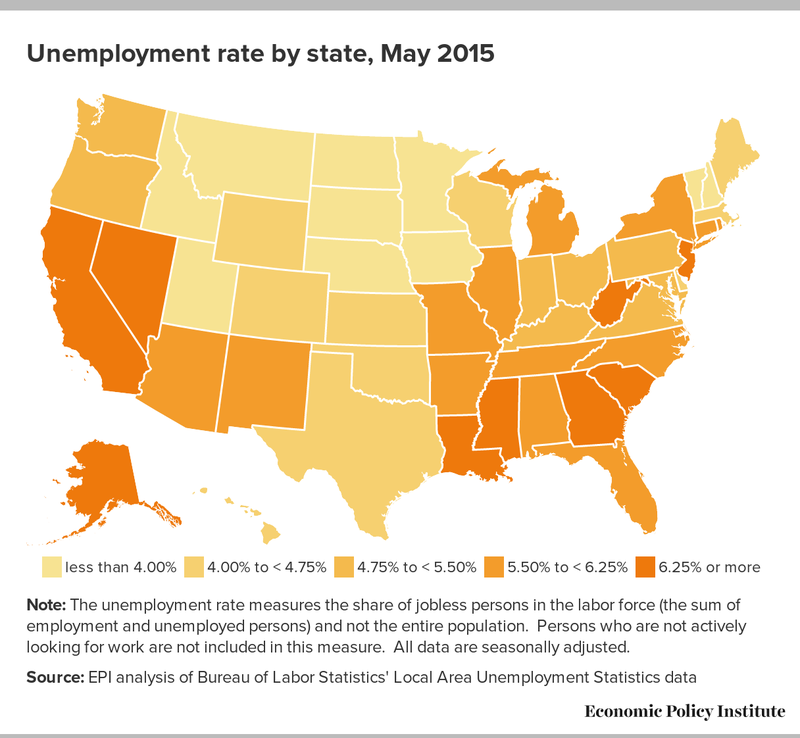 From February to May, unemployment rose in 20 states while the national unemployment rate remained unchanged. The largest increases in unemployment occurred in West Virginia (+1.1 ppt), Alaska (+0.5 ppt), North Carolina (+0.4 ppt), Oklahoma (+0.4 ppt), and South Dakota (+0.4 ppt). West Virginia and Alaska’s unemployment increases are troubling—West Virginia’s unemployment rate of 7.2 percent is now second only to the District of Columbia (7.3 percent), and Alaska is not far behind at 6.8 percent. Significant labor-force expansions in many of the other states where unemployment rose suggest some of the increases may be workers returning to the job search in light of improved job opportunities—14 of the 20 had labor force increases larger than the national average. May’s state jobs report showed that most state labor markets were generally on course, albeit at a pace that’s far from ideal. However, the negatives in the report should serve as a reminder that no state can rely indefinitely on natural resource booms for job growth. As economic conditions continue to improve, state lawmakers should be making investments in physical (infrastructure) and human capital (education, workforce development) that will spur job creation in the short term and create sustainable growth in the long term.